Vinyl records are a rarity these days and many are collectors’ items. The shop we discovered held a treasure trove of recordings from the golden age of Egyptian music. Artists such as Umm Kulthum, Abd al-Halim Hafiz, Farid al-Atrash, etc., as well as some of the foundational Moroccan musicians from the mid-twentieth century, artists like Nass al-Ghiwane, Jil Jilala, Hamid al-Zahir, and many other folk, shaabi, Malhun, and Andalusian musicians. Most of the stock here has never been played! The records are pristine, some with slightly faded covers or a bit of mold from siting untouched for thirty plus years. The beautiful dark hardwood displays give this place the feel of a museum, while accentuating the vivid and colourful artwork of these rare gems. The prices are extremely reasonable, however if you are a collector be warned it is easy to spend money here. 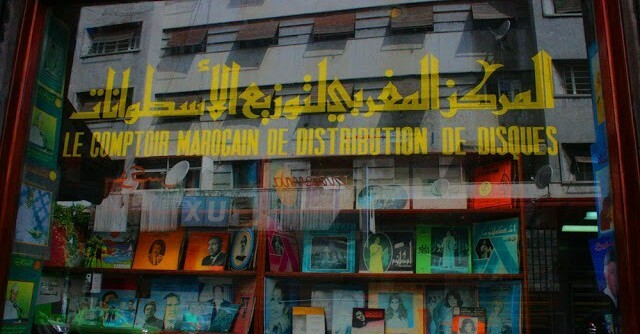 Walking through the decaying streets of Casablanca with my head held high to admire the colonial architecture, I stumble upon a dusty record shop on the corner of Boulevard de Paris and Abderrahman Sehraoui. At the back of the shop sits an old man. I greet him with salam aleikum and begin to browse the stacks of vinyl records bursting out of the glass cabinets and hanging from the ceiling on strings. My eye catches a few favourites: The Isaac Hayes Movement released in 1970; Uprising by Bob Marley and the Wailers (1980); Michael Jackson’s Thriller (1982), For Once in my Life by Stevie Wonder (1968); Fela Kuti; Italian pop singers Mina and Lucio Battisti, which surprised me; and many of Egypt’s very best including Umm Kulthum, Mohammed Abdel Wahab, Abdel Halim Hafez and Sayed Darwish. At a loss for what to pick, I ask the owner for his advice and Monsieur Gam begins to tell me his life story. Of Berber origin, Gam was born in Agadir in the 1940s and migrated to Casablanca with his family at the age of six. His love of comics and the cinema introduced him to music. He began selling things on the street then worked as a bus driver until he saved enough money to open up a record shop in 1970, going on to produce records under his label Disques Gam. He shows me a black-and-white picture taken in 1966 of a handsome young black man with dark sunglasses and a leather jacket and says with a laugh: “Marlon Brando!” I say he looks more like Clark Gable with his striking yet elegant features. He takes this as a compliment and tells me how he knows all the great films and actors of the golden age of cinema, and reels off a list of famous stars, directors and films. Now aged 70, Gam has lived a full life. His four children have done well and his eldest is a doctor in Canada. I ask him how business is today. Gam says Moroccans no longer buy vinyl and he relies mainly on foreigners. “First there were lots of record shops and cinemas in Casa, but now many have closed down. My shop is one of the very few record shops left in the city … Life passes by so quickly,” he says with a smile as we say goodbye.